"It can't be a sustainable end state for there to be an entirely unfettered space that's utterly beyond law enforcement for criminals to hide," Wray said at the RSA Conference in San Francisco, quoted by Gizmodo. "We have to figure out a way to deal with this problem." 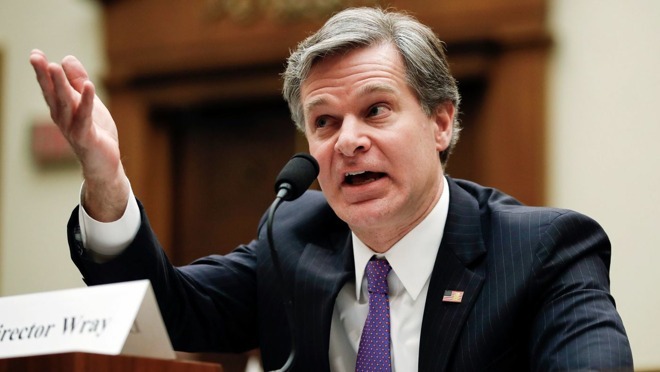 Wray mentioned that long-running talks between the U.S. government and tech companies are still ongoing, but was quiet on details. "I'm hearing increasingly that there are solutions," he said. He may be building on the views of people like U.S. Deputy Attorney General Rod Rosenstein, who in 2017 promoted the idea of "responsible encryption," using examples like centralized security keys — such as the ones Apple uses to comply with warrants for iCloud data — and sanctioned key recovery methods when someone forgets the password to an encrypted computer. Those systems are potentially vulnerable to hacking or phishing, however. End-to-end encryption is the most secure form of online communication available, as its design allows only senders and recipients to decipher transmitted contents. Even platform holders like Apple and Facebook are unable to read messages unless they're archived somewhere less secure. As a result, government officials like Wray, Rosenstein and executive assistant FBI director Amy Hess have regularly complained about communications "going dark" to law enforcement and spy agencies. Apple typically complies with police warrants and National Security Agency requests, but in 2016 famously fought the FBI and Justice Department over demands for a backdoor into the iPhone of San Bernardino shooter Syed Rizwan Farook. The company argued that it couldn't be compelled to write new code, and that doing so would fundamentally weaken the security of iOS. The DOJ's case ultimately fizzled when it turned to a third-party service that successfully cracked Farook's iPhone 5c. In February, Apple and a collection of trade groups, NGOs, and other tech companies submitted comments opposing an Australian law passed in December which demands businesses help the government access encrypted messages. The view is that the law is too vague, and could be used to demand weakened encryption not just in Australia but eventually in any country within the "Five Eyes" network — Australia, Canada, New Zealand, the UK and the U.S. Those countries regularly collaborate on intelligence matters, and the network recently claimed that "privacy is not an absolute," with the further assertion that it would aim to access encrypted data through legislation.